With so many options before you, it can be difficult to shop for the perfect flooring. Fortunately, Flooring Canada Charlottetown has a broad selection of the finest vinyl flooring in Charlottetown, PE, to upgrade your space. Our flooring showroom offers an endless variety of choice, ensuring that you get the gorgeous new floors you deserve. Stop by our showroom today to find out more about the styles, colours, and textures we offer. Whether you want our remarkable vinyl or our plush carpet, your new floors will never reach their full potential without the right installation. 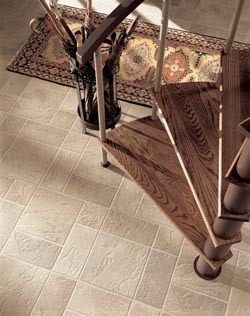 That is why we offer top-quality vinyl flooring installation, ensuring that nothing goes wrong. Our team of expert contractors go to great lengths to get every last detail perfect during the installation process, making sure that your new floors not only look incredible but that they also last for years down the road. With us on your side, you know you’re getting the best possible floors in your home. The key to perfectly installing new vinyl flooring is proper preparation. The first step in our process is to schedule a time to come and inspect your home, make all the proper measurements, and ensure that we have everything in order before we begin the installation. It also allows us to work with the utmost efficiency, getting the job done quickly without sacrificing quality. You’ll get the perfect new floors you need with only minimal disruption to your life. Whether you want the classic elegance of tile or the high-scale warmth of hardwood, we can help you find the perfect vinyl flooring. Even if you don’t know exactly what you want, we are here to help. Let our team of design experts help you find the right look for your personal aesthetic. Contact us right away to find out why so many in the area turn to us for flooring. We are proud to serve Charlottetown, PE, and the surrounding area.